Ado Kyrou was to the French what Raymond Durgnat was to the British and Parker Tyler was to the Americans. "Je vous en conjure, apprenez a voir les `mauvais' films, ils sont parfois sublimes" ("I beg you, learn to see `bad' films; they are sometimes sublime"). 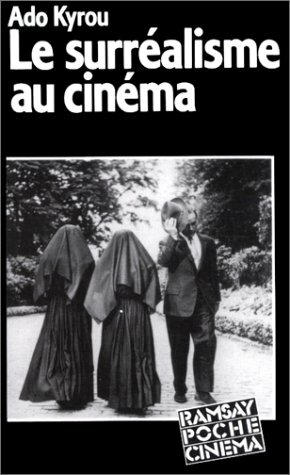 Ado Kyrou, Le Surrealisme au cinema, 276. Adonis Kyrou (1923 - 1985) was born in Greece. Residing in France, where he was a critic, filmmaker and author of L'age d'or de la carte postale (1966), Amour - érotisme & cinéma (1957) and Le surréalisme au cinéma (1952|1963), the last two published by Eric Losfeld's publishing house Le Terrain Vague. Born in Greece, resident in France, he was a critic, filmmaker and author of L'age d'or de la carte postale (1966), Amour - érotisme & cinéma (1957) and Le surréalisme au cinéma (1952|1963), the last two published by Eric Losfeld's publishing house Le Terrain Vague. He also wrote for the French film journal Positif and possibly for Midi Minuit Fantastique, again both published by Eric Losfeld. Le surréalisme au cinéma Ombres Blanches Editions Arcane 1953, couverture illustrée d'une photo de Man Ray, nombreuses photos in texto, 282 pp. The Monk is a film adaptation of Matthew Lewis's infamous book.